Because sometimes love just isn't enough. Most girls my age adore their mothers and the loving relationship that they've built at this point. If they're really lucky, they never had to work towards that dynamic because it's all they've ever known (an anomaly, I know). After all, both parents and children alike have made it through the struggles of the terrible twos and the terrible teens, so after that everything should pretty much be rainbows and sunshine. Sadly, I haven't been afforded this coming-of-age experience. I love my mom, I appreciate my mom, and I'm extremely proud of my mom for all that she's accomplished and all that she's overcome as a single mother, but I can't say that I adore her on a regular day. I haven't adored her in a long time — and that's not easy to say. No, she's never hurt me physically, and yes she cares about my well-being, but sometimes she can hurt my spirit — that's enough for me to distance myself from anyone. Not for nothing, there's no winning when your mother is passive aggressive, manipulative, and prone to bouts of depression or at least not if you're waiting on her to hand these "wins" to you. However, if you learn to take them for yourself then you can win and you can find your way to happiness, in spite of the naggy bulk of misery that can sometimes bring you down. 1. Understanding her history, and how it made her the person she is today. My mother's mother was the actual worst! I'm talking abandonment, blatant favoritism based on the skin tone of her biracial children, and even being paid off to remain mum about the abuse my father inflicted on my mother. By 15, my mom had moved out on her own; by 16, she was pregnant with me; and, by 17, she (a child) had a baby of her own. That all seems like bad news, but the good news is that before 30 she had not one but two college degrees, as a single mother — defying all the odds. While my mom is good for playing favorites (not necessarily right, but fairly common), she's not capable of any of the truly awful things that she went through as a child. However, because of what she triumphed over, I'm often told to look past my annoyance and frustration towards her. 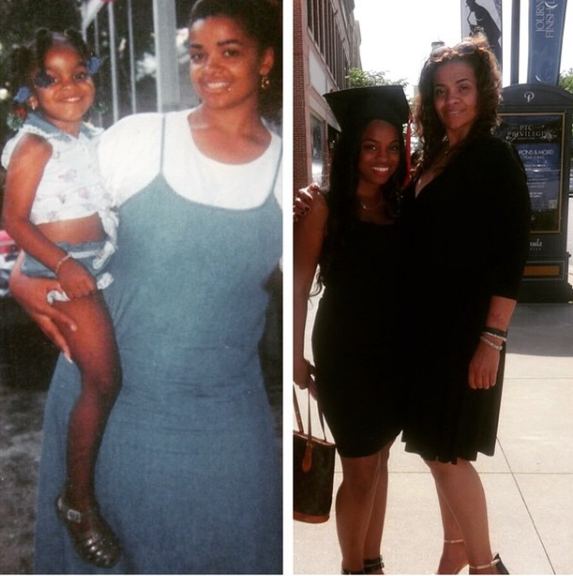 This woman raised herself and learned what it meant to be a good mother through trial and error — through it all, she found a way to, in many ways, do better by me than her mother ever did for her. And, reminding myself of this is always the first step towards radically accepting her sometimes toxic mothering methods. I started thinking about that term, “radical acceptance,” after reading through the new book by YourTango’s founder Andrea Miller — Radical Acceptance: The Secret to Happy, Lasting Love. She talks a lot about extending empathy and compassion, even in difficult relationships, which definitely applies to my relationship with my mother. Flaws and all, I can't help but acknowledge and even admire her strength and courage. So, I often use that adoration to keep from going under when her more negative traits and prevalent traits begin to frustrate me. But, of course, it's not always as simple as I make it sound. 2. Becoming aware of my own limits. I have to know myself enough for the both of us. I'm stubborn and I'm very unwilling to go down without a fight, in the same way that my mother is, even though nine times out of ten, I end up being the one sitting in a puddle of tears by the time we're done arguing. That said, I know my limitations and what I can and can't deal with when it comes to my mother. This mostly means time and distance. Basically, our relationship works better when we have a prison type of setup. Minimal time together, limited phone time, and a whole lot of f*cking distance. We need these time and distance restraints in place because the truth is, without them, I'd forego my mother and her bullsh*t altogether. So, this is a major key to our relationship and keeping it as healthy as a seemingly unhealthy relationship can be. I have to accept this reality, even if it requires some seriously radical acceptance on my part. 3. Validating my own damn self. My mom, much like the Danny DeVito and Rhea Perlman, who played the parents in Matilda, cannot and will not admit when she's wrong. Hell, I think she unconsciously shares their logic too. Remember that scene? "Besides, even if you didn't do it, I'm going to punish you. Because I'm big and you're small. I'm right and you're wrong. And there's nothing you can do about it." Often times, when we're arguing, my feelings are made to feel small and insignificant because she has at one point or another provided for me. Essentially, I'm not allowed to stand up for myself because she parents. And I, in exchange, must allow her to be right at all costs, even if that means going without being heard or having my feelings understood. Sometimes, she won't even say it, she'll just stare this awful stare that makes you feel like what you just said qualifies you to be moved into a psych-ward. She has a way of making you feel like your feelings are valid and insignificant by the time you finish arguing, and it's exhausting. So, I just started validating my own damn feelings. I think this is particularly difficult because who doesn't want their mom's approval? 3. I'm happy enough for the both of us. The one thing I'm always understanding of is that like myself and many others — my mother suffers from depression. Only thing is, even as her daughter, I'm an outsider and that means sometimes it's hard to tell where the depression ends and her personality begins. So, when she gets in the car and unconsciously brings down my entire mood with her lackluster attitude, I try to remain perky. I try to be understanding. 4. Killing her with kindness. This may be more on the passive-aggressive side, but it definitely works. In situations where I know I just can't win, I put a smile on my face and in my best cheerleader impression (not too hard considering there was a time I actually was a cheerleader). I become her 'Yes Man' — anything you want. You got it. You deserve it. Absolutely, Mom. Sometimes she sees through it (I am her daughter after all), but you can't say too much to a person for being faux happy. 5. Understanding the 'grass is always greener' trap. My biggest issue with my mother is the energy she carries, and the criticism she unloads on everyone else. And sure, her more disagreeable traits can make it difficult to remember how I once adored her, and even more difficult to remember that she really is a good person (only guilty of being unaware of herself). However, despite it all, I know my mother loves me in her crazy way. She's always cared for me and never put me in harm's way. When it counts she hugs me and even still kisses my boo-boos. Despite me sitting here b*tching about all that makes my mom a b*tch of a mother, I can't deny that I've got it good in comparison to children who have been abandoned, abused, or somehow neglected. At best, we'll end up in family therapy at some point in my life but, fortunately, I don't think our problems run deeper than that. However, there's one thing that she's taught me that sticks with me (she probably said it in reference to herself, TBH): You can't change anyone but yourself. And, as hard as that pill is to swallow, it's the truth! All the time I spend stressing about her is valuable time I could be using to focus on myself. So with that, I try my best to radically accept her as a means to better me — to put my spirit in a better place, no matter what the mood may be.